The bent over row is the go-to exercise for building a big strong back that demands respect. Form on this lift will differ depending on the lifter and style, but those who are serious about their back training typically perform some variation of this movement. Not only does the bent over row increase size and strength of the lats, rhomboids, and traps, but also the erectors, and to some degree, the glutes and hamstrings. When done correctly, it will teach proper hip-hinging mechanics and help protect the lower back, which is a commonly injured area for gym rats. 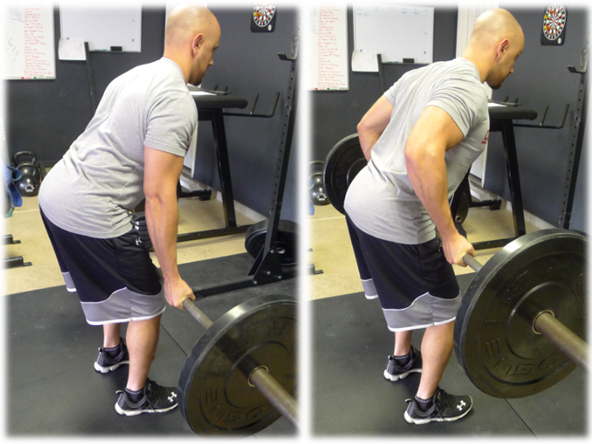 Many powerlifters believe that bent over row variations can transfer favorably to the deadlift. The average lifter attacks the bench press and then slacks on their back development – don’t be this person. This can lead to imbalances and even worse, injuries. This article is intended to give you a better understanding of the bent over row and its variations so you can build a badass back. Let’s get to it! Form differs depending on the row. I will discuss three of the most popular forms of bent over rows and the technique involved in each. For the classic bent over row, set your feet approximately shoulder-width apart. A medium to wide pronated (overhand, palms facing you) grip is used. With the bar on the ground placed around 6-10 inches in front of the shins, bend over and grip the bar with good posture: chest up and a neutral head and spine. You want the hips to be high and the torso to be nearly parallel with the floor. The shins will be vertical. The position is somewhat similar to the bottom of a stiff-legged deadlift. Maintain this position throughout the movement. Raise the bar off the ground with slight hip extension while keeping the arms stiff. From this position, the bar is rowed to the lower chest/upper abdominal region by pulling through the elbows. You want scapular retraction, shoulder extension, and elbow flexion to occur in sync, but focus your attention on the midback musculature and not on the biceps. Once reaching the torso, the bar is lowered under control back to the start position with the elbows fully extended. The bar is not rested on the floor between repetitions; it hovers slightly above the ground. Some common mistakes seen while performing the bent over row include: using momentum and heaving the weight towards the body, going too heavy which causes the lifter to use a more upright torso position, losing neutral spinal alignment, reaching forward with the neck, pulling too much with the arms, allowing the elbows to flare outward rather than keeping them fairly tucked, and pulling too much with the shoulders without the accompanying scapular motion. The Pendlay row, popularized by Olympic weightlifting coach Glenn Pendlay, is commonly used to increase strength and power in the rowing muscles. The main difference between the Pendlay row and the basic bent over row is that the bar is rested on the floor between reps and the movement is performed explosively with some accompanying thoracic extension. This thoracic extension is thought to increase lat recruitment. Grip width is typically wider than a classic bent over row with the hands pronated (overhand, palms facing you). Each rep is started from a dead stop with the bar resting on the floor. The upper body is positioned parallel to the ground with good lower back position and the upper back relaxed (slightly flexed). From the start position, the bar is explosively rowed to the lower chest/upper abdominal region with simultaneous slight thoracic extension. The hips do not move during the movement. The key to this exercise is allowing the upper back to ‘relax’ at the bottom position and forcefully ‘squeezing’ the upper back as the bar is being rowed. Some common mistakes made while performing the Pendlay row include: not resting the bar on the floor between reps, using the lower body and hips to perform the movement, not flexing and extending at the thoracic spine during the movement, and not maintaining a torso relatively parallel to the ground position. The Yates row, popularized by former bodybuilder and Mr. Olympia Dorian Yates, is performed quite differently than the classic bent over row. A medium to wide supinated (underhand, palms facing away from you) grip is used. Conversely, a pronated grip can be used, but usually the lift is performed supinated. Start the movement standing tall with good posture: chest up and a neutral head and spine. From this standing position, hinge at the hips while maintaining good spine positioning. Unlike the classic bent over row, where the upper body is parallel to the floor, the Yates row is performed with the upper body in a more upright position, at approximately 70 degrees relative to the ground. This allows for heavier weights to be utilized. From this bottom position, the bar is rowed to the crease of the hip by pulling through the elbows. Again, you want scapular retraction, shoulder extension, and elbow flexion to occur in sync, but this variation will incorporate a bit more bicep activity into the movement. It is also alleged to recruit more lower lat muscle. Once reaching the hip crease/lower abdominal region, the bar is lowered under control back to the start position with elbows fully extended. The bar is not rested on the floor between repetitions. Some common mistakes made while performing the Yates row include: using too limited of range of motion, relying too much on momentum from the lower body, flaring the arms outward, and being too upright (I’ve seen lifters do this movement almost completely vertical). Variations of the bent over row can be performed by using a hex bar, cambered bar, variable resistance or a combination of these. The hex bar, also known at the trap bar, allows the lifter to perform the movement in the same fashion as a regular barbell but places the hands in a neutral position. This feels more comfortable for some lifters and tends to feel most comfortable for people who have wrist, elbow or shoulder issues. With the hex bar, the load is closer to the mid-line of the body, making the movement feel more natural than with a traditional barbell. The range of motion can be increased with the hex bar if the lifter has the scapular mobility to row past the chest without the scapulae anteriorly tilting. The hex bar path is arced in order to avoid collision with the buttocks. This is my favorite bent over row exercise. The cambered bar can be used to perform any of the rowing variations listed above as well. The cambered bar increases the range of motion during the movement, which may promote greater hypertrophy. For some lifters, the cambered bar is not useful on account of mobility limitations, which will prevent them from getting any additional range of motion than they normally would from a regular barbell. Different forms of variable resistance may be used with any of the row variations, but these techniques are usually reserved for more advanced lifters. Chains and bands offer a different feel than straight weight. As the weight is unloaded off the floor or as the bands are stretched, the tension increases, making the lift harder at the top of the movement. Bands can be looped over the collars and stepped on or attached via a deadlift platform or power rack with band pegs. Chains can be draped over the bar or hung from the collars. 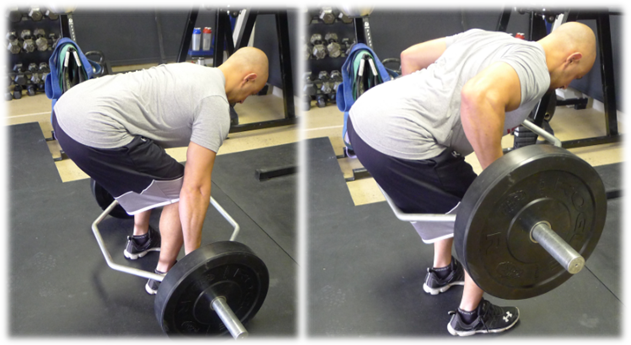 There are a couple of other things to keep in mind when performing the bent over row. Grip strength may become an issue for certain lifters especially when using the Pendlay row and Yates row. When the weight gets heavier, trainees often have a problem holding onto the barbell. Chalk can help and lifting straps may be employed. I wouldn’t advise the use of lifting straps unless it is completely necessary, and I’d use them sparingly. Grip training can be used to increase grip strength – check out this deadlift article HERE for some grip training ideas. 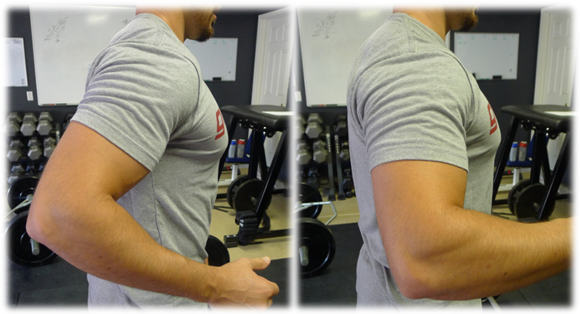 While performing the row, some lifters have a tendency to pull too far past the midline of the body, which may cause the humerus to migrate forward in the socket. This is not good. To avoid this, the elbow shouldn’t move too far behind the body. This keeps the lifter in a safer position. However, many lifters can row slightly past the midline of the body by utilizing more scapular retraction without compromising the integrity of the shoulder capsule. Experiment to figure out what works best for you. Please watch the following 8-minute instructional video discussing the classic bent over row, the Pendlay row, the Yates row, and the hex bar row. This article was intended to give you a closer look at the mostly commonly performed versions of the bent over row and to teach you how to perform them correctly. Learning each of the variations listed in this article will give you a better understanding of your body and how you can use these different row variations to target slightly different muscles in your back. Row to grow! Could you do the first style you showed, but reset on each one to make it a little easier on lower back? Sure you could Jake. Your back should be able to handle it though. For example, at The Glute Lab, the 3 of us use around 185-215 with our classic bent over rows, but we can each deadlift in the mid 500’s. So holding 185-215 for 3-10 reps is no problem. I’ve implemented the Yates row in my training and I like to go into lumbar extension at the top. I can really feel it in my lats when I do that. They rarely fatigue any other way. I can really concentrate the contraction too it seems. I’ve heard some people recommend rowing with a sustained lat flare. Have you ever come across this ‘technique’?Comprehensive article. Thanks for sharing Bret. Never heard of that for rows Nic (lat flare). I could see it causing problems though, so I’d avoid against it in case you were considering experimenting with it. Nope just curious. Thanks again. Hi Bret…just wondering. I thought pronated grip (overhand grip) is our palms facing away from us and supinated (underhand grip), palms are facing to us? Sorry did I get it mixed up all this time? I never do this exercise, nor do I recommend it. I also think it is technically difficult. How often do you see people butcher this? Don’t agree. I actually find that my back does very well with the row. Every lift can be done porly, including pull ups and lst pull downs hence this post – how to do them properly. I actually agree. Bent over row fatigues lower back. If a lifter is doing deadlifts, there is no need to do bent over rows. In my opinion, chest supported row is a much better alternative. Just realized I do a Yates style. Except I’m probably at 60 degrees instead of 70, and I use a pronated grip. Problem is I always feel rows in my upper back (traps mostly) and not a lot in my lats. Where am I going wrong? In your opinion, if you had to do one as an assistance, which would you pick? Classic bent over? How about t-bar row? Where do you think that variation fits in? Also, how would you progress your assistance so as to not get in the way of proper deadlift progression? Don’t want to let super heavy rows hinder recovery. Great article and thanks for your reply! That’s a great point. I actually have avoid bent rows for quite a while now as I felt they got in the way of my deadlifts. There are so many other ways to work the back that don’t do that. High-bench-pull poops all over those 3. Bret, How do you ever expect to keep the body in complete balance when your lifting different loads for different muscle groups?. I feel classic rows wit torso parallel to floor puts too much stress on lumbar spine. yates rows works well with me. All of you who say that classic rows “stress” your back or hurt your back are just weak and clearly do not Deadlift. Or your Deadlift is weak and bad. If your core is strong and stabilizing your hips and spine when in this position, rowing would only add to it. That’s my 2 cents. Actually, Jim, my deadlift is around 500 at a body weight of 225. But thanks for your concern. A row is an assistance exercise. It should ASSIST the big 3: deadlift, squat, and bench. If it’s getting in the way, it needs to be altered or eliminated. Hey Bret, I can’t access the Military press link. When I click the link it takes me to the Bent Over Row link. Thanks for any help! Geez. Been schooled again. Been doing the Bet Over Row wrong all these years. Thanks for the heads up Bret ” The rear admiral” Contreras. Sorry just had to say that. Bret, I have always done bent over bar bell rows with my back at about 45 degrees. I tried your version where my back is parallel with the floor. I dropped the weight to 135 thinking it would be easy. It was not. I did 4×10. (This was after doing 8×4 pull-ups .) I have done the same at the 45 degrees at 200 plus. Is this normal, or am I a wimp? My spinal erectors were taxed. This a good thing? Inquiring minds want to know. Hi Bret. Wondering about using the Yates Row as more of an entry level free-standing BB row for my women clients, especially those who don’t yet have the strength to keep their spine and hips in proper positioning to perform the horizontal rows. Would this be a good place to start for an UNSUPPORTED row, or should I leave out unsupported rows in general until they gain the strength and ability necessary? Maybe I can do horizontal rows with them but position the bar on a bench so that they don’t need to pull from the ground? ?They’d be “mostly” horizontal. And I’d keep the load really light to start?? Thanks. Classic bent over row is my favorite. It actually feels like my back is more relaxed in this position, maybe because at the bottom of it my arms with the bar are stretching some of the muscles there. In the barbell row, specially the cambered bar row, the upper.arm must not go back too much. As mentioned in the article – pull the scapulae back. After your scapulae is completely pulled back, any efforts to further pull the upper arm back to touch the bar to the chest is futile…even harmful. It’s bad for the shoulder joint. Don’t think abt touching the bar to the chest. Think only about scapular retraction. Doesn’t matter if the bar doesn’t touch the chest. For the same reason, in bench press, the bar shouldn’t be touched to the chest at the end of the lowering phase. Stop where the upper arm is in line and parallel to your torso. Taking the bar lower than that will mess.up your shoulder. Zorba have you ever trained anyone? I’m all for safe training but the vast majority of people do just fine with the bar touching their chest. No I haven’t trained anyone and nor do I have to to know this. So when you say the majority do well with the bar touching their chest, are toy talking about the row or bench press? Also, I said that keeping in mind the long limbed ectomorph lifters. In both row and BP, over extension of the shoulder isn’t the good thing.. May not be a problem short term but in the long term it can be. By then it can be too late. Genuine question – doesn’t over extending the shoulder tilt it anteriorly? What do you say? I myself am a thin, narrow boned 6’1 tall lifter and I notice, specially in BP that touching the bar to the chest may be unnecessary. Same with rows. To avoid any injury, specially one that surfaces later, I don’t go too past the torso..just a little bit.